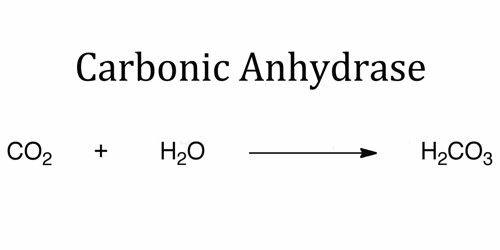 Carbonic anhydrase is an enzyme that assists rapid inter-conversion of carbon dioxide and water into carbonic acid, protons and bicarbonate ions. The active site of most carbonic anhydrases contains a zinc ion; they are therefore classified as metalloenzymes. Carbonic anhydrase enzyme also found in red blood cells, gastric mucosa, pancreatic cells, and renal tubules that catalyzes the interconversion of carbon dioxide (CO2) and carbonic acid (H2CO3). Carbonic anhydrase plays an important role in respiration by influencing CO2 transport in the blood. The enzyme also functions in the formation of hydrochloric acid by the stomach. Carbonic anhydrases have been found in all kingdoms of life. They have essential roles in facilitating the transport of carbon dioxide and protons in the intracellular space, across biological membranes and in the layers of the extracellular space; they are also involved in many other processes, from respiration and photosynthesis in eukaryotes to cyanate degradation in prokaryotes. The mechanism of action of the mammalian carbonic anhydrase has been studied in depth. The enzyme employs a two-step mechanism: in the first step, there is a nucleophilic attack of a zinc-bound hydroxide ion on carbon dioxide; in the second step, the active site is regenerated by the ionisation of the zinc-bound water molecule and the removal of a proton from the active site. 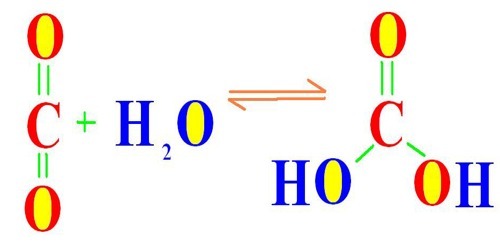 The active site can exist in two forms: a high pH form that is active in the hydration of carbon dioxide and a low pH form that is active in the dehydration of bicarbonate. The reaction rate of carbonic anhydrase is one of the fastest of all enzymes, and its rate is typically limited by the diffusion rate of its substrates. Typical catalytic rates of the different forms of this enzyme ranging between 104 and 106 reactions per second. The reverse reaction is relatively slow (kinetics in the 15-second range) in the absence of a catalyst. This is why a carbonated drink does not instantly degas when opening the container; however it will rapidly degas in the mouth when it comes in contact with carbonic anhydrase that is contained in saliva. 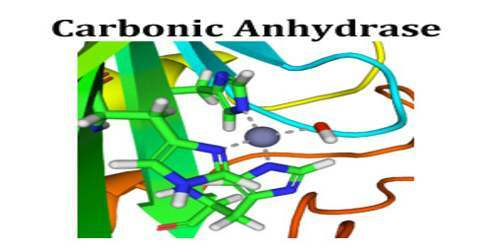 Although the enzyme is beneficial in many cases, it also catalyzes negative impacts on the body, and a special type of drug, called a carbonic anhydrase inhibitor, is available to counter this activity. A disease caused by this enzyme’s activity, but not the enzyme itself, is glaucoma, in which pressure from acidic fluid buildup decreases eyesight over time. Some forms of cancer are also accelerated by carbonic anhydrase as well, including ovarian, breast, colon and kidney cancers.